It just wouldn't be Christmas without the tree! Whether it's dressed in colored lights, all in white, or has a specific theme, you just can't go wrong. Choosing a tree can be a fun holiday family tradition that brings everyone together and gets you in the spirit. This year, why not consider cutting your own tree? If you haven't ever chopped your own tree, it's a lot of fun. There is just something about wandering through a field of trees and searching until you lay eyes on the perfect one. For those who like to get to their tree early, this is a great way to get a farm fresh Christmas tree that is sure to last until New Year's Day. You don't have to wonder about when it was cut. For so many reasons cutting and choosing your own tree is a holiday season must. 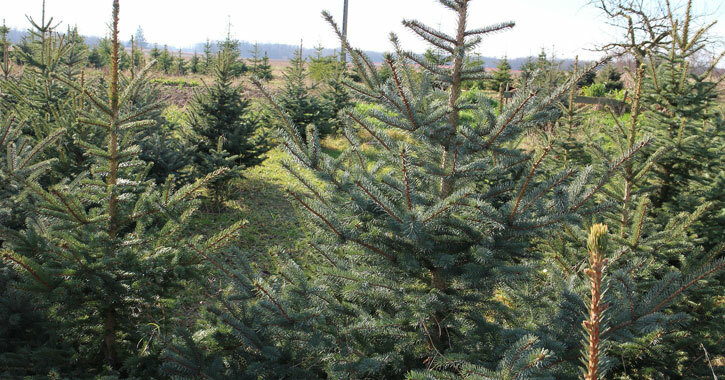 See a list of Christmas tree farms in the Saratoga area and cut your tree today! Do your homework before heading out. Different Christmas tree varities offer different perks. For instance, if you have heavy ornaments, you'll want to go with a Douglas Fir, if needle retention is important to you you'll need to avoid Norway Spruce, and so forth. Avoid placing your tree near a heat source such as radiators, heating vents, and fireplaces. Also try to keep the tree out of areas where it might get bumped or knocked over. Before you set out to find the perfect tree you'll want to measure how tall your ceilings are and the width of the space you have chosen. Also, don't forget to take into account the height of your tree stand, as well as the height of the tree topper decoration. Take the tape measure with you so you can measure the trees you're considering to make sure they will fit. Once you're outside it may be hard to keep things to scale. Bring a pair of heavy gloves with you to protect your hands and an old blanket to protect your car from needles and sap. Take twine or rope to secure the tree to your car (although many tree lots provide this - better safe than sorry). Keep in mind that a tree looks better when the ornaments have enough room to hang straight. For ornaments to hang straight you want a tree with a good amount of space between the branches. Bring an unbreakable ornament with you and hang it on several branches to see if there is room for it to hang straight. Cutting your own tree? It doesn't get any fresher than that! Choosing from a lot? You can tell if a tree is fresh by looking at the needles. They should look shiny and green - not dry or brown. They should not fall off when you pull on a branch or shake the tree. Many lots and farms will wrap the tree in netting for you and they should have twine on site. If you have a van or truck, the best bet is to lay the tree inside your car or trunk for the drive home. If you drive with the tree on the roof of your car, make sure to tie it securely to the car. You may want to wrap it in the tarp or old blanket that we mentioned earlier. Start with the lights before the ornaments working from the "inside" of the tree near the trunk to the outside. Also, work bottom to top. When you're ready for the ornaments begin with the "fillers" - these are the classic basic colored balls. Hang these and any matching or complimenting ornaments first to get a good base going, then work your way to the individual, stand alone decorations. Hang some ornaments close to the trunk of the tree and even in the back of the tree that might be against a wall. It might seem silly, but it will really add depth and cohesiveness to the whole look. A color theme other than red and green - blue and silver, silver and gold, or red and white. Nature - pinecones, winter berries, birds, and flowers. Celestial - sun, moon, and stars. Kids toys - trolls, Barbie dolls, and teddy bears.